Luffness New is probably the oldest “new” golf course in the world. An application was made to the Laird of Luffness to lay out a golf course on his land way back in 1867 and so Luffness Golf Club was inaugurated. After the Laird decided to reclaim his land, Tom Morris was approached to design a new course, which started out in life as a 17-hole layout but by 1872, an 18-hole course was in play. A professional tournament in 1894 marked the formal opening of the current course with Willie Auchterlonie (Open Champion 1893), Andrew Kirkcaldy, Tom Morris (all of St Andrews), David Grant, Ben Sayers, G. Sayers, P. Wynne (all of North Berwick), J. Simpson (Edinburgh), B. Campbell (Musselburgh), G. Shepherd ("Old Luffness"), E. Fitzjohn (Muirfield) and H. Gillane (Gullane). A handsome winning purse of £25 was made available and, after 36 holes, Ben Sayers emerged victorious with a winning score of 166. Some members of the old club were unhappy with the new arrangements and they decided to break away to form Kilspindie four years later, using the old 5-hole Wanster course that was already established where the present day holes seven to eleven are located, next to Gosford Bay. Nobody doubts that Old Tom Morris designed the original course in 1894, but plenty of changes have taken place down the years. According to Fred Hawtree, writing in Simpson & Co. Golf Architects: "Willie Park Junior also had connections with it later. This course is listed by Simpson in 1931 as 'one of ours'. One would expect that being only a mile away or so from the family home of Simpson's pupil, the realisation of the plans was very much in the hands of Mackenzie Ross. Perhaps he was even responsible for getting the job in the first place." Luffness New is underrated and certainly overshadowed by Muirfield, Gullane and North Berwick. 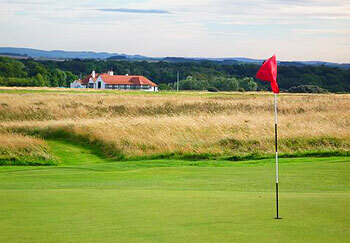 This little-known links plays host to qualifying rounds when the Open is held at Muirfield. It’s a challenging course with interesting green complexes. The members are proud of their putting surfaces and, all year round, they are amongst the truest in the area. It only measures 6,502 yards from the back tees, but the lowly par of 70 makes low scoring rather challenging. Luffness New comes to life after you’ve walked across the road to the 6th tee. Here, you are faced with a delightful short par three, called “Quarry”. From this point onwards, the course goes on from strength to strength. “From Gullane Hill to the Luffness Club-house is one huge stretch of turf,” wrote Darwin, “and such turf! The finest, smoothest, and most delicate that ever was seen.” The Luffness Strokesaver refers to the turf as “being of the springy type which gives gently to the feet, like a rich Persian carpet.” There is no doubt - it’s the real thing! Luffness is a quiet, but private, members' club. Everyone is very friendly, but bear in mind that men may need to don a jacket and tie in order to take refreshments in the bar. Originally designed by Old Tom Morris and opened in 1894, this inland links course is more of what I expected to play when I came to Scotland. Fast and firm greens, ridiculous rolls on the fairway, thick fescue and gobs of deep faced bunkers. Beside the winds, the mounding makes it difficult to roll up your approach shot. Even though the putting surfaces are relatively flat with some undulations, getting to them is the issue. Trust me, it is easy to lose an errant shot in the rough and even more difficult to get out of. Words of advice – ‘Avoid the bunkers at all cost and hit a club that you know you can hit straight’. From there on in you are on your own. This is strategic course and you need to be patient here. The first hole exemplifies what I am saying. From the back tees it only 330 yards. You can hit any club you want however if you are too aggressive, fescue line the fairway and a large bunker comes into play on the right side. Either way you are left with a short approach shot to raised green with five pot bunkers to avoid up front. On Luffness you need to be able to hit it low on your tee shots and high ones for your iron play. There is no official Pro Shop here. As Head Pro and bartender for the day, John Cleary reminded me “balls, tees and single malt is all that’s needed”. And went through plenty of each. This is a very prestigious private course with a long waiting list, but visitors are welcome at £95 per round. We visited Luffness New last year, and we went for the full enchilada: 36 holes of golf with the lunch wedged in between the rounds. Don't forget to bring your jacket and tie! For me it is difficult to describe the golf at Luffness New, but I understand why people call this old school links golf . The course itself looks a bit dull when you pass it on the road to Gullane, but it is only once you are actually on the course, you see the subtle challenges that lay ahead. It also has some of the quirkiness that seems to come with links golf. It is a course that forces you to just play shot by shot, in stead of trying to score a certain number, and for me that is a unique characteristic that only a very few courses offer. Apart from the outstanding quality of the golf course in general, it is the design and placing of the bunkers on the fairway, but even more so around the greens that makes this venue so special. Although the greens at Longniddry had slightly better roll and consistency, the design of the green complexes of Luffness New are top class. Sometimes being on the fairway is not enough: when arriving at your ball, you realise you had to be at the other side of the fairway to have had a chance to get the ball anywhere near the pin. Some will find it highly old fashioned to have warm lunch, forcing you to dress up and down in between rounds, we just enjoyed the ride. At least it gives you a second chance at the holes you messed up in the morning. Luffness New serves up an uncomplicated yet delicious feast of pure and traditional links golf laid out naturally across unbelievably firm and fast turf, some of the best I’ve golfed on. Thanks to the gentle, but not insignificant undulations, I could play here for eternity, never get bored and would continually find new ways to play each hole because I can think of few courses more exposed to the wind and where you must continually work the ball, predominantly under the breeze. I arrived just before 2.40pm and whilst waiting to pay my green-fee behind the bar (the lady was in the middle of carefully pouring up a tray with a dozen glasses of Kummel on it) I got chatting to a couple of seasoned gentleman deep into their first pint of Belhaven Best. I asked if they had played that morning. Their reply was, “No laddie, but we’ve been round this afternoon”. Slow play isn’t an issue at Luffness. Indeed, I had the course to myself and I suspect Luffness, founded in 1894 and designed by Old Tom Morris, receives the fewest plays of all courses in East Lothian. It doesn’t actively seek the attention of the endless number of golfers converging in Gullane but the welcome for those enquiring to play is warm and welcoming. As a result of the limited play the condition was immaculate and the sense of peaceful isolation only amplified. The opening five holes are on a parcel of land separated to the rest of the course by the snaking coastal A198 road. They are an excellent introduction with a perfect balance of movement in the land, fine green complexes and an early indication of the fierce bunkering that you will encounter during the round. The par-three third is a truly wonderful hole with a brilliant green site whilst anyone in need of a confidence boost should head to the tee on the descending fourth and strike a drive with a breeze at their back; in conjunction with the firm ground this 572-yard par-five was reduced to a drive and a mid-iron! The closest comparison I can make for English compatriots would be Rye down on the Sussex coast, certainly away from the course, where they certainly do it their own way. Jacket and tie is required in the clubhouse after 10.15am here and the (very fine) golf is almost secondary to the actual belonging of The Club. I was somewhat disappointed with Luffness. The opening hole was nice, hitting up and over some wonderful bunkering but that was close to the highlight of the round. The first 5 holes are played on the clubhouse side of the A198 and at the conclusion of those I was dearly hoping for a change in proceedings as these holes were laid out in a fairly flat, mundane way. Over the road the views improved a bit and briefly so did the golf with the 7th and 8th going up and then down a part of Gullane Hill but it was with some regret that I realised the back nine yellow flags of Luffness were not the yellow flags of the adjoining Gullane #3 course as those holes looked much more interesting than the remainder of Luffness. The bunkering is the highlight of the course. Some small elevation changes, you could turn the tee boxes into putting greens they were so smooth, but overall I got bored with it. The rough was kept quite thin but I’m sure it could get nasty if allowed. The greens were very nice, a bit brown but true. For many years whilst visiting the beautiful town of Gullane I would glance to the right as I drove past and say to myself that I must play Luffness New the next time I’m here. Well 15 years ago I did just that and started what has been a long lived admiration for what I feel is one of the most charming links courses in Scotland. Recently, I visited again and the more times I play the course the more I appreciate its subtlety, angles, routing, beautiful setting and well designed strategic bunkering. In particular, the raised cross bunkering on some of the par fours. The greens are well renowned and they are some of the best surfaces you will ever roll a putt on. Your tee shots are varied, needing driver, 3 wood and long irons for placement on the differing length holes. The rough often bites here so accuracy is needed. The course flows well and although it is generally over flat ground there is good elevation change on 7 and 8 which offers beautiful views across Aberlady Bay to Edinburgh in the distance. A small number of blind drives over ridges also add to the variation. My favourite holes……1- a lovely opening par 4 that demands a precise short iron over a bank of deep cross bunkers to a large sloping green from the front. 3 – A mid length par 3 to possibly the best green complex on the course. 7 – A short par 4 that demands an accurate drive to leave a short pitch to a raised green on the hillside. 9 – A long testing par four that runs downhill after a drive over the ridge. 16 – Testing short par 3 to a well bunkered green that backs onto the bay. However, for me, the real stars of the show are the 12th, 15th and 17th which are all par fours with sublime cross bunkering that ensure great thought is given to the approach shots. I would go as far to say that the 17th is one of my favourite holes in East Lothian. I don’t feel that Luffness often gets the love it deserves. No it’s not a course to hold the great championships but it holds its own with difficulty. It doesn’t get the accolades that are bestowed on the great Scottish courses. It is what it is. I am a low category 1 golfer and it tests me every time whether the wind is blowing or not. When reviewing a golf course I feel that one of the most important characteristics is ‘charm’ and in my view this place has it. I fully accept that this is not one of the great championship links courses but I often judge a course by the warm feeling you get inside when you think back to your day there. And for that I place Luffness New in the same company as The Golf House Club, North Berwick, Woking, New Zealand, Formby, Alwoodley, Royal West Norfolk, Royal Cinque Ports and of course Sunningdale. Before we played, a senior Muirfield member with whom we were staying cautioned us: "It looks like an easy course and a scoring opportunity, but when you look at your card afterwards it will not look that way at all!". He was right, of course! Why? Certainly, during our visit the answer was to be found on and around the greens. An approach played to the foregreen would have had a good chance to stop close to the flag at Muirfield and at North Berwick whereas it just ran through to the back on most holes at Luffness. Given another chance we might just have started to "get it". In other words, I think this is a course where you should play at least two rounds to give yourself a fair chance. Now would you? £90 for one round may not be value for money compared to alternatives on offer, but £105 for the day certainly is. However, do factor in the time-warp experience that is lunch in their clubhouse. We decided to enjoy it on the club's terms and were very happy. If you think you cannot, go elsewhere. Luffness New is not overly long but it is still a very good test of your golfing skills. The rough in places is quite penal. The bunkers are neat and well defined and the relatively small greens are very true. None of the greens are raised, they are all at fairway level, so you can putt from well back on the fringe. Five holes are on the clubhouse side of the A198 but it is the holes that follow from the 6th out to Aberlady Bay that provide a lovely peaceful stretch of enjoyable links. The 6th is one of the best holes at Luffness. This par three is only 155 yards but there is plenty to think about. The shot is uphill and the green is surrounded by four strategically positioned pot bunkers. The 12th is a good looking short par four with the difficulty coming from the six fairway bunkers. Fourteen is a reasonably long par four at 435 yards and the rough here is very punitive. Conversely, the 15th is rated the second hardest and is only 346 yards. The 16th is another excellent par three featuring six greenside bunkers, including a large one at the front. Three raised bunkers about fifty yards short of the green are the feature of the par four 17th. The final hole is a good finish at 416 yards, slight dogleg left. This green has a number of grass mounds behind to prevent balls from going onto the nearby road. On a visit to North Berwick I loaded up my jacket and tie and headed off to Luffness New a course I had driven past many times but never played. The course was quiet which allowed me to complete my two rounds in five and a half hours. The fairways were superb unfortunately I wasn’t on them often enough which led me to lose countless balls in the penal rough. The good bunkering added to the difficulty of the course but I would have to say the greens didn’t live up to their reputation certainly no better than Gullane 2 or the West Links. In many ways the layout was understandably similar to the neighbouring Gullane courses. All in all a tough course well worth a visit but not as welcoming as many of the neighbouring links. There are two east lothian courses I have played recently where the attitude to vistors has definitely changed. Luffness New and Muirfield. They were stuffy and unwelcoming but now they are a delight to play and could not be more helpful to visitors. The rough is penal June-September and accuracy is rewarded. I found this a very fair challenge of links golf. Luffness New may not have the spectacular dunes of Turnberry, the ups and downs of nearby Gullane, or the intimacy with the sea of North Berwick, but it is an excellent layout o some of the finest turf one could hope to strike a long iron from. The course is not the longest but the many pot bunkers and fiendish rough mean that you better hit it pretty straight or big numbers can sneek up on you. I hit just about every club in my bag, which I think of as a good indicator of a well designed course. My favourite holes were the 1st, 12th and 16th - short par 4s with cross bunkering 30-40 yards short of the green. If you can forget that this is not the most visually stunning links course you will ever play and concentrate on the fine and fair layout, I can guarantee you will enjoy yourself.